Mollie Koble earned her Master of Science in Occupational Therapy and Bachelor of Science in University Studies from University of Mary in Bismarck. Mollie has experience in outpatient pediatrics, in an inpatient psychiatric unit, transitional care, the school system, and at a pediatric sensory clinic treating a variety of diagnoses. Mollie is licensed to practice in North Dakota. 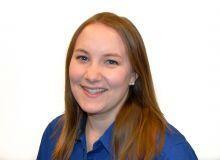 Mollie's areas of interest include sensory integration, vision, and infant and child development. She is NBCOT certified and AED/CPR certified.